Scrub or peel potatoes and cut into about 1 inch chunks. Put in saucepan, cover with water, add 1 teaspoon salt and bring to a boil. Reduce heat and simmer until just tender, about 10 minutes. 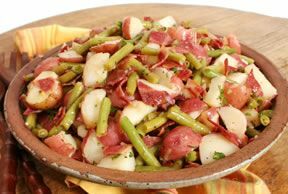 Gently mix together potatoes, beans, celery, onion, and half the radishes. Mix in the sauce. Chill if you prefer, although it's also good at room temperature. 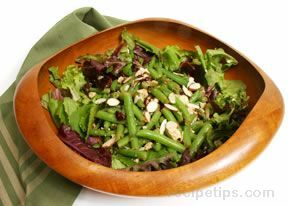 Put into serving bowl or arrange, using lettuce leaves, if desired, on individual serving plates. 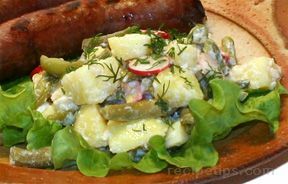 Top with chopped herbs and reserved radishes.